26th of October 2017 : Free Sight Association iw panelist of the event titled : “Pulling the Rug from Under Our Feet: What is UNSCR 1325 Without Civil Society Freedoms that Enable Meaningful Participation?” Organized by WPP, WILPF, , Free Sight Association,Duke IHRC, WEO, AWO, Al-Hayat Center for Civil Society Development, , NOVACT, NGO WG WPS. On Thursday, 26 October 2017, a side event entitled , “Pulling the Rug from Under Our Feet:What is the UNSCR 1325 Without Civil Society Freedoms?” was hosted on the margins of the 17th anniversary of United Nations Security Councik Resolution(UNSCR) 1325.The event was Hosted By the Women Peacemakers Program(WPP) and the Dutch Mission , in collaboration with Duke Law’s International Human Rights Clinic, Al-Hayat Center for Civil Society Develepment,Arab Women Organisation of Jordan , NOVACT, Free Sight Association, Iraqi Al-Amal Association, Women’s International League for Peace and Freedom. At a time where normative support for the Women , Peace and Security (WPS) Agenda is higher than ever, the event aimed to bring attention to how securitised frameworkrs of counter-terrorism and militarism undermine women civil society and contribute to “shrinking civil society space”.The panelists and audience were invited to engage in a critical reflection on whether current civil society WPS strategies suffice to adress these new realities. A roundtable with the representatives of women-led organisations from Tunisia , Jordan and Iraqi Kurdistan.This roundtable provided insights into the struggles many civil society organisations face in keeping their operations afloat.These challenges include the impact of banking regulations , which are making it increasingly difficult to receive funds timely-or at all- for donor-approved projects;donors’extensive application and reporting requirements , which make direct access to funding a challenge for many women-led organisations and the ground;the fact that international non-governmental organisations (NGOs) are increasingly coming in and competing for funding or are subcontracting local groups, which undermines the building of a strong locally-owned women’s movement for peace and justice ; discriminatory banking regulations, such as not being able to open a business bank account;transparency requirements, which often puts their workers or beneficiaries at risk ; as well as increasingly restrictive NGO regulations imposed by the government, such as the requirement to budget for male companions to accompany women for work-related travel ; and general prejudice towards empowering women , which is seen as a red flag by local and national governments . 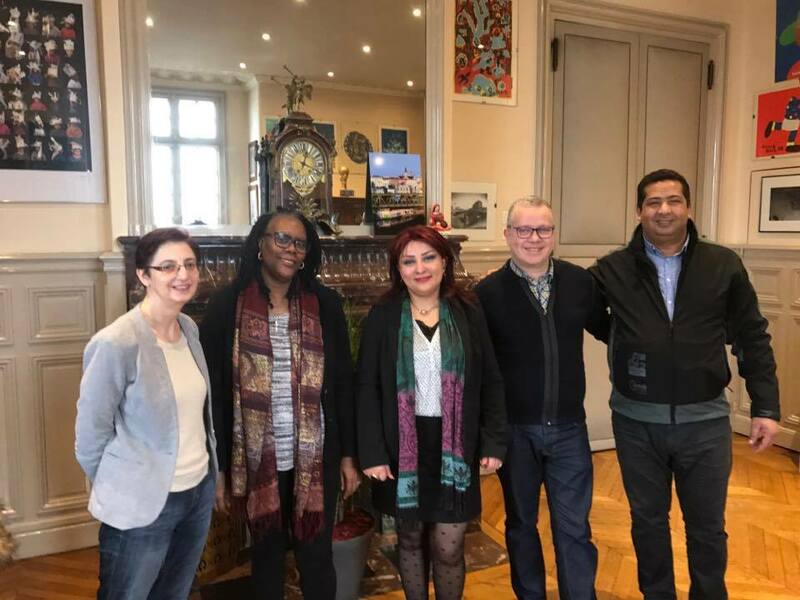 Planning to continue collaboration between Saint Denis City Hall and Free Sight Association regarding the role of municipalities in the fight against violent extremism. February 4, 2017 at the Saint Denis Town Hall.